For the past few days, we enjoyed lots of delicious Penang Food – Chendul, Assam Laksa, and more. And there was one more dish we have yet to try – the Penang Char Koay Teow. It is a mix of white flat noodles (hor fun) with egg, prawn, bean sprouts, cockles and chives fried with sweet sauce and black soya sauce. 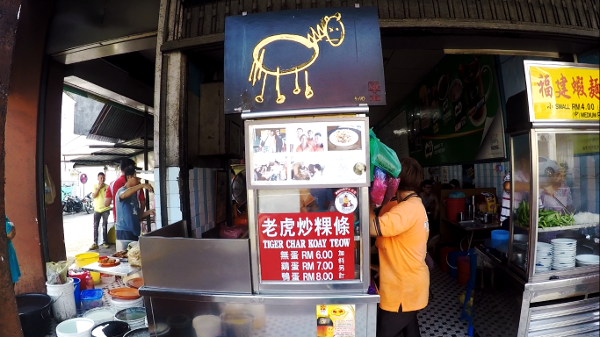 We explored the popular food street – Carnavon Street – and found the well known Tiger Char Koay Teow (老虎炒粿条). It is located at the junction of Lebuh Carnavon and Lebuh Melayu. Join us today as I share with you this culinary delight, including what it is, where to find it, how to get there and why this is one of the Penang dishes that you must try when you visit this enchanting city? 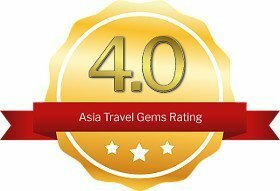 Book Your Rooms with Agoda and Get Up to 70% Off! Click above image! What does Carnavon Street look like? 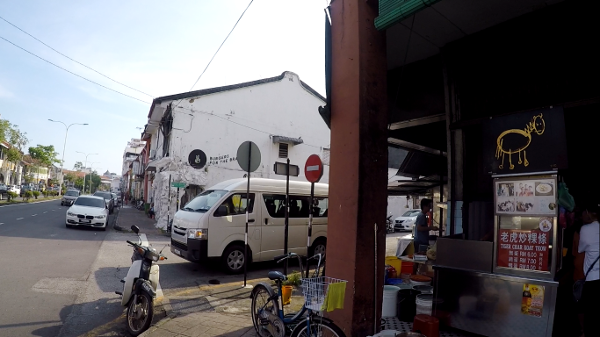 Where is Tiger Char Koay Teow (老虎炒粿条) located along this street? How is the dish cooked? What does it look like? What else is available at the same coffee shop? Answers to all this, and more in the video below. Enjoy watching! Tiger Char Koay Teow (老虎炒粿条) is a food stall inside a coffee shop named Kafe Ping Hooi. This coffee shop is located at the junction of Carnavon Street and Malay Street. 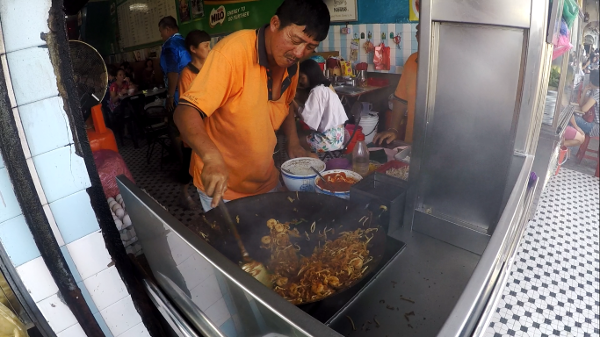 There are many famous and popular Char Koay Teow stalls in Penang. Tiger Char Koay Teow (老虎炒粿条) is often listed as one of the top few. The stall received its name from the owner and also founder of this brand. His name has the Chinese word ‘虎’, which means ‘Tiger’. It was a crowded morning. Business as usual for them, I am sure. We were fortunate to be able to secure an empty table. After we seated, we ordered the food. Tip: When you see an empty table. Quickly get it! There was a bit of wait time for the food to arrive. Yet, it was not that long a wait. When it landed on our table, we could smell the fragrance. Mmmmm. A first taste and we were awed! There was that fragrant taste that Chinese call ‘Wok Hei’. It is not easy to describe this taste. But most Chinese recognize it. And it is something not easily found with most cooked foods nowadays. Then the heavenly mix of flat noodles with bean sprouts, cockles, prawns, eggs and chives. Flavors that were so full and glorious! The servings were small. So tempting to order another plate. But, we held back because there was so much more Penang Food to try. How to Order the Food? Simply look for the servers dressed in orange polo t-shirts. Give them the order. Tell them where you are seated. Then wait for the food to arrive. Tip: Payment is immediate upon delivery of the order. Cash only. There were other foods available at Ping Hooi Coffee Shop. Another popular food stall was the Lobak King. 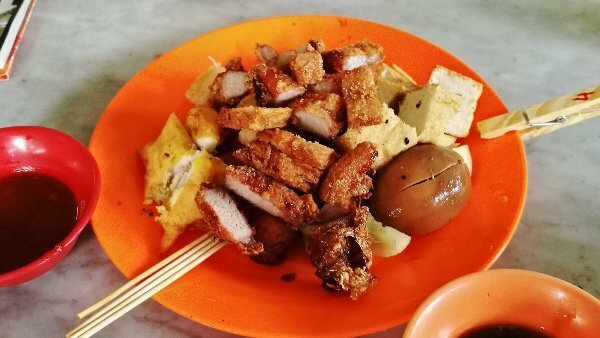 They sold the popular five-spiced pork rolls (also known as Ngoh Hiang), and many other items such as bean curd, battered fish, prawn fritters, tofu skin (bean curd skin), and more. The food was served with two types of sauces. They were the sweet dark sauce and spicy chili sauce. If you are not able to take spicy sauce, just dip the food in the sweet dark sauce. Everything we ordered was fried to a crunchy crispness. The taste was flavorful. Together with the sauce, it was pure delight! 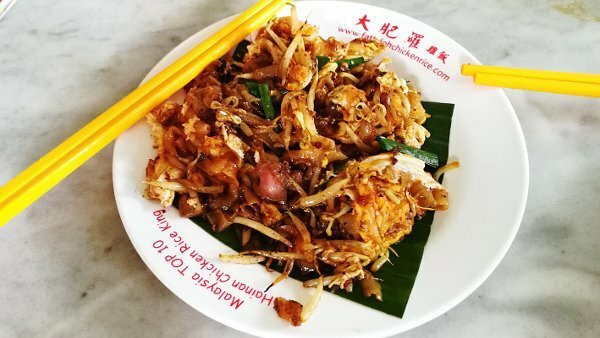 Your Penang trip will not be complete without a taste of the popular Penang Char Koay Teow. And my recommendation for this delectable dish? Tiger Char Koay Teow (老虎炒粿条). It is simply unforgettable. 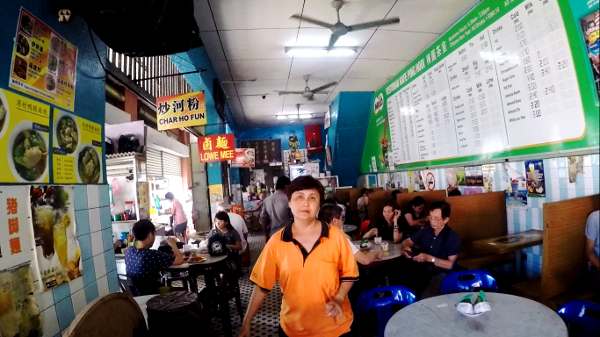 Even today, as I write this post, I am thinking of returning to George Town, Penang to enjoy the taste of it. Every ingredient contributed to the full flavor and taste. The prawns were juicy and fresh. The bean sprouts were crunchy. The other ingredients created a mix that pleased the palate. If only the dining conditions were better. Then again, it is a coffee shop, and it does make it more enchanting. As I mentioned, the serving was small. While it may be just enough for some, I wanted another plate. I have to fly to George Town for that. And I will do it. Tip: Take your time. Enjoy each bite. Or you will be like me, yearning for it again. Tiger Char Koay Teow (老虎炒粿条) is located at the junction of Carnavon Street and Malay Street. You can’t miss it. The signs are big enough to be seen from afar. See the map below for actual location. We did walk to this place by foot. 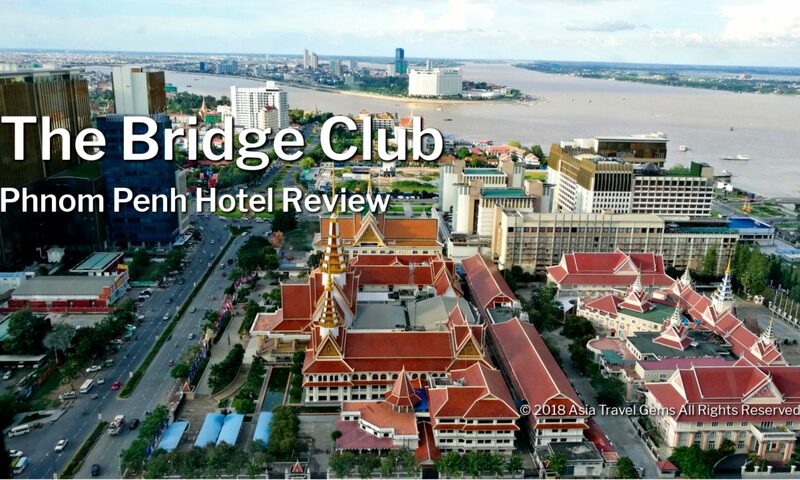 But that was only because it was near the hotel where we stayed – Cititel Express Penang. Check with your hotel concierge if it is within walking distance. If not, then consider catching a cab or take Grab. There is a Free bus service operated by Rapid Penang. It can bring you to major attractions, shops and city events. It is called the Central Area Transit (CAT). Get a map from their website, and simply board their buses at any specially marked stops on specified routes. The only concern here is that you will have to travel within their bus schedules. If you drove to Penang, you are at an advantage. Traffic is not as heavy as cities such as Kuala Lumpur. Navigating around is easy, especially if you have Waze app. There is ample parking spaces on the streets. But may be full on peak periods. They rarely go by meter. Tip: Negotiate and agree on a price before you take the taxi. Better Tip: Do not take the cab, go by Grab (see below). This is my preferred option. One reason is that there is no need to negotiate. Another is that the price is usually reasonable and affordable. No hassles. It is so easy to travel around in cities now because of Grab. Just download the app, state your destination, a driver is assigned to you, take the transport, and you arrive at your destination. Comfortable and easy. I have switched to Grab for my travels within a city ever since this option became available. If you have ANY questions about this review, ANY at all, please submit your questions as comments below. I will be happy to help you out.